Cam's Cinematic Episodes: Film Review: PIRATES OF THE CARIBBEAN: AT WORLD'S END: Captain Jack Returns To Find His Franchise Seriously Keelhauled! 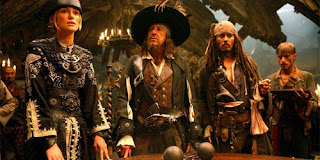 Film Review: PIRATES OF THE CARIBBEAN: AT WORLD'S END: Captain Jack Returns To Find His Franchise Seriously Keelhauled! Wow, what the heck happened here? I was among the many that hoorawed and rejoiced over the first chapter in this series, The Curse Of The Black Pearl. And while I was never truly begging for a sequel, I found myself tossed and fairly delighted by the imaginative Dead Man's Chest. Through it all I never truly fell into Pirates-mania like the rest of the collective world, but I still felt a glimmer of anticipation for this final disappointing entry, which we will examine and puzzle over today. This film, as you all know, is called At World's End. Picking up where the last film left us, Pirates 3 follows Elizabeth Swann (Keira Knightley), Will Turner (Orlando Bloom) and their back-from-the-dead associate Barbossa (G eoffrey Rush), as they find directions and help in entering Davy Jones' Locker to free Captain Jack Sparrow (Johnny Depp). From there, the characters commit a truly mind-numbing number of double crosses and deceptive tricks on their way to reunite the Pirate Lords. This act will provide them with the strength to overcome the East India Trading Company, who is aiming to take over the seas with the aid of their new weapon: Davy Jones' The Flying Dutchman. When it's all over, relationships are settled, old feuds are ended, and a movie-goers hope for a truly great film, are long gone. Now, obviously I skipped over a large amount of detail regarding the story of the film (Unlike my epic sweeping recounting of Spider-Man 3's plot which managed to sound long-winded even to m e...). The reason for this is that the film is so stuffed to the gills with "story" that I likely wouldn't finish the task before the film's DVD release. This is a near three hour film with some of the most talented artists in the world involved. Mediocrity should not result from this. The film should either be a great time at the movies, or a spectacular (and likely fascinating) failure. The fact that At World's End ma nages to be neither is the most frustrating aspect. What I found truly amazing about this film was how it failed to build upon any of my favorite aspects of its lead-in Dead Man's Chest. 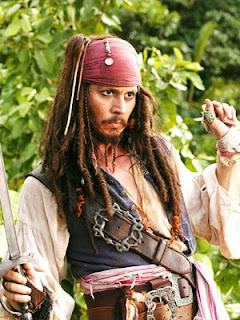 Captain Jack is sidelined for the first hour of the film and never really becomes anything more than a supporting character in the film. Sure, he has his funny moments (Though definitely less than the previous films), but they don't really add up because he has so little bearing on what is going on. The first film gave us a mad genius who managed to stay alive only by his sheer insane logic and baffling inventiveness. Here he's like a weird uncle that always manages to stumble into the middle of important events. He's entertaining, but rarely necessary. I also was eager to see more of the spectacular Davy Jones (Bill Nighy) and his kraken beast. HA! Director Gore Verbinski and writers Ted Elliott and Terry Rossio shove Jones into the b ackground and write the kraken right out of the picture. Instead they choose to place all the emphasis on the evil (and boring) Lord Cuttler Beckett (Tom Hollander). Beckett is a sneering nemesis in the vein of the most forgettable Bond villains (Like the guy in The Living Daylights), who's most sinister trait is that he wants to rid the seas of pirates. Is this really a bad thing? Erase the wackiness of the whole Black Pearl gang and let's remember that pirates were generally pretty awful individuals. He could be seen as a heroic figure in a different film... Except for the fact that he (SPOILER ALERT) kills Elizabeth's pops (Jonathan Pryce - in a cameo here). Why? I'm not really sure. This plot point is handled so incompetently (and off-screen) that there is no impact to the development. It's a reason for the guy to be booed and hissed at. Now, I'll admit the circumstances in how the Elizabeth finds out are eerily beautiful and dream-like and a testament to the actors and the effects and set design crew, but this development needed a little more underscoring. All of this blundering really only ends up reminding us why the Beckett character should be a bit player. Preferably located 100 ft behind the left shoulder of Davy Jones. 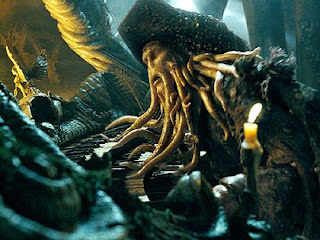 Davy Jones had all the potential to be one of cinema's great villains as well as one of the coolest looking. It's small consolation that he merely winds up with the latter prize (Good job ILM!). The filmmakers make the curious choice to just push him into generic back-up heavy territory. The poignancy of the character, regarding his love-sick heart, is bungled all over the place and his exit from the film is underwhelming to put it lightly. Also annoying is the mere walk-on status given to Norrington (Jack Davenport) who actually became interesting in the previous film. Orlando Bloom is fine, I suppose. He's pleasant without having too much impact on the story. Even his part in the unsatisfying Elizabeth/Will relationship finale is pretty weak. I gotta ask: Did anyone really invest themselves that much in this relationship? It was pleasant enough in the first film but the convoluted turns it's taken over the last two has pretty much killed any goodwill I had towards it. Completely wasted is Chow Yun-Fat as Siamese pirate Sao Feng. The character's role in the film is pretty pointless and could have easily been excised completely. It appeared to me that his only function was to make the stupid decision that leads to Elizabeth's ridiculous final arc. I must also say that I flabbergasted at how much is given to Naomi Harris' Tia Dalma character. Often incomprehensible, this character never works in large doses and gets bad laughs when her "important" role in the finale is revealed. Okay, let's push all this negativity aside. Why am I going to recommend (albeit slightly) this troubling film? Well, because familiarity goes a long way. The world created within the film is so immersive that it's hard not to give credit where it's due. This is a universe unto itself that has become a memorable part of the pop culture landscape. It's fun to see all these characters and the wild effects that ILM has cooked up. It must be said that the final forty minute battle scene is pretty amazing to behold and earns the film higher marks for the immense scale and scope involved. This ain't no minor scuffle. I must also admit that while the film doesn't close how I feel it should, it is for the most part a satisfying conclusion to the series. The way it harkens back to the first film is somewhat poetic. It's difficult for a 168 minute movie to not deflate, and the filmmakers come close to succeeding. The film can be a tad frustrating, but it is never dull. If this series does go on, I can't recommend enough to cut the running times down. These films aren't meant to be so long-winded. They should try to emulate the Indiana Jones films w hich were stylistically similar but embraced speed and a two hour length. They never felt rushed, and the Pirates films would fit this model beautifully. There is no reason that the third chapter of the series should be the same length as The Godfather. The mythology simply isn't complex or interesting enough to sustain it. That said, for an uneventful summer night there's worse out there... Though there's also better.